Seattle, the gateway to the gold rush, is a beautiful city on the northwest corner of mainland United States. It is a seaport situated on an isthmus between Puget Sound and Lake Washington, about 100 miles (160 km) south of Canada – US border. 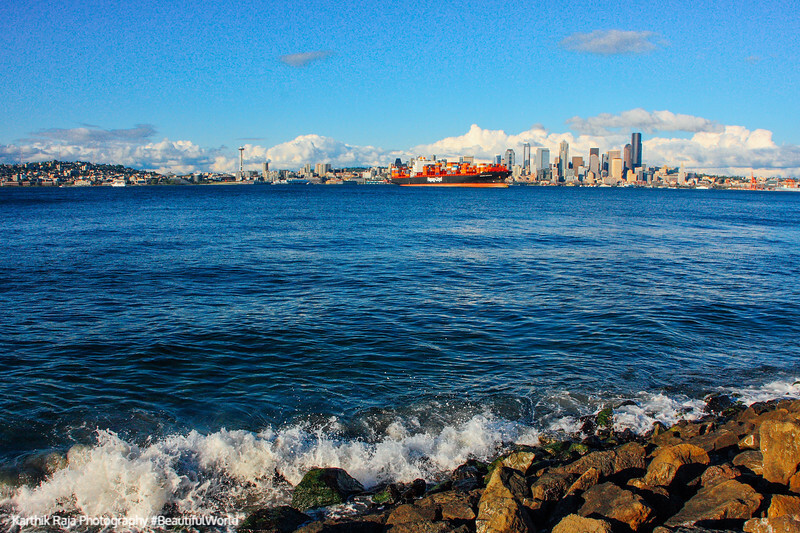 Elliot Bay provides a natural safe harbor for the city. The weather is the spoil sport to this panoramic city with a rain festival running from January 1st to December 31st. Day 1: Tourist! Tourist! We woke up to the first rays of cloud filtered, subdued, sunlight in our 450 sqft, room with a magnificent view, at the downtown Pan Pacific Hotel. Through one window, downtown Seattle beckoned and through the other, the Space Needle majestically peered in. We headed to Pike Place Market for our breakfast, a brisk 20 minute walk from our hotel. Pike Place is a market that opened on August 17, 1907, and is one of the oldest continually operated public farmers’ markets in the United States. It hosts more than 500 shops including a grand fish market. Flowers sellers, pastry shops, coffee huts, street performers all line the market. It is listed on the U.S. National Register of Historic Places. The fish market is especially fun to see as fish are thrown, songs are sung, and people merrily watch the sales. Restored from bankruptcy in 1986, it is now world famous. We ate at Piroshky Piroshky, a Russian bakery – try the apple-cinnamon pastry, grabbed a chocolate croissant at Le Panier and chased it all down with a freshly squeezed orange juice from Bacco. Satisfied with breakfast, we made a quick photo stop at the very first Starbucks and then continued on Alaskan Way towards Pioneer Square. Alaskan Way takes you past the many piers and past the Seattle Aquarium. Seattle’s founders settled in Pioneer Square in 1852. The early structures in the neighborhood were mostly wooden, and nearly all burned in the Great Seattle Fire of 1889. The city was rebuilt and one of the best ways to relive it, is by taking the Underground Tour. We grabbed a quick lunch at Virginia Inn and then joined the explorers a level below current day Seattle. The tour is 90 minutes long, but at the end you learn all the hidden underground stories of Seattle’s early days. The skylights on the road was especially enlightening. From one tour to another, we jumped onboard the Ride the Ducks tour from Westlake Point but not before grabbing some hot chocolate and walnut filled chocolates from the Chocolate Factory. We had never done a Duck tour, and it was one of the funniest. Led by Captain Justin Credible, we toured the different districts of Seattle and also spent 30 minutes on Lake Union, reliving Sleepless in Seattle through Tom Hanks’ house on the Pier. A precious hour to relax back in our hotel, and then we met with friends for dinner at the Wasabi Bistro, probably the best sushi we have had. Belltown is a great neighborhood that comes alive after 9pm. Dinner was followed by drinks at Ventana, and at 2:30 am, with the bar shutting down, after a few screwdrivers, and after hours of catching up with friends from 5th grade, high school and college we headed back to our hotel. Day 2: Reserved Hike Let it never be said that we waste a minute of our vacation just chilling. It isn’t a vacation if we don’t pack it with things to do, so we got up early, took the ferry from Pier 52 and headed to Baindbridge Island. A 40 minute ride through Elliot Bay and suddenly we were in an island, far from the bustle of the city, walking through lush fern forests. Breakfast was a pit stop at Steamliner Diner, a local favorite. We took a taxi to Bloedel Reserve, a natural and highly-landscaped forest reserve with lakes, manicured lawns, a Japanese garden, a Reflection Pool and the most enchanting marshlands and moss garden. There is a 2 mile hike, so wear comfortable shoes, and carry a raincoat. The number of visitors is also controlled so make reservations early. 2 hours later we were back in the ferry skimming across Elliott Bay. Hungry from the hike and the ferry ride, we headed to Travelers. If you took an oath never to eat Indian food in any city outside of India, this is the place to break it. Started by hippies with a quaint but extremely well developed taste for all things roadside, this little gem serves you a full thali, on an ever-silver plate with masala chai. The samosa is fresh and the alu parantha comes with the tastiest of pickles and creamiest of dahis. Travelers is part restaurant, part grocery, and part trinket shop. It was strange to see a kurta-clad, braided hair gentleman, sitting with an iPad, sipping hot chai in an incense filled entrance lobby with a mini puja room and Hindi music bellowing from the speakers. Travelers was hip, without trying to be. End of May is a good time in Seattle, with the Northwest Folklife festival taking up much of city’s time and space. Crowded in to the Seattle Center this festival showcases all that is art. Glass blowers, musicians, dancers, magicians, hippies, nomads, gypsies, hula hoopers, flame throwers all attend and participate. We spent the evening walking into stalls, rummaging through jewelry racks and lounging on the lawns, soaking in the light drizzle rain and the atmosphere all at once. Sticking with our Seattle mission we headed for dinner with friends to Queen Sheba in Capitol Hill. Communal Ethiopian style eating, with lots of enjeera and the softest Bamia and we were ready to tackle the night at the Seattle Laser Dome. On Sunday evening, we were treated to Laser Sublime, an amalgamation of music from heavy metal to Bob Marley. Take blankets and pillows as nothing awakens you like watching lasers on a Planetarium ceiling, some new music filling the air, lying on your back and cozying up with your love. Only wish we had made it on Thursday evening for the Led Zep show. The shows ends at 10:30 so there is enough time to catch desert at B&O Espresso. Try the profiteroles au chocolat or if it hasn’t sold out, the Chocolate Pot. Day 3: Let the Sun shine through. Finally, unrestricted sunlight. Blue skies. Seattle in a whole new light. Wow! The Olympic mountains shelters the city of Seattle from the Pacific and become visible from our room for the first time. We lazed in our room, enjoying the light and the view. Breakfast turned into brunch at the Old Spaghetti Factory followed by a walk through the Olympic Sculpture Park, a nine-acre public park in downtown Seattle. Built on reclaimed industrial land, it houses permanent and visiting sculptures from various artists. Our next stop was the Experience Music Project and Science Fiction Museum at the Seattle Center. Founded by Microsoft co-founder Paul Allen in 2000 and designed by architect Frank Gehry, it offers an inspiring journey into the life of Jimi Hendrix and showcases the growth of science fiction as a legitimate art form. Hendrix died at 27, but he lives on forever in the heart of Seattle. We spent a few hours, listening and watching old Hendrix concerts, jamming on musical instruments and walking through chambers in a spacecraft. With the sky all blue and the grey threatening clouds all but cottony swirls in the air, we decided to take in Seattle from all its glorious viewpoints. Thanks to a friend and his revamped BMW we headed to Kerry Park, a 1.6 acre park in Queen Anne, Seattle. Perched high on the hill, it offers an expansive view of the Seattle skyline, Elliott Bay and Puget Sound. From there, a 30 minute car ride takes you through Seattle, over Elliott Bay and into West Seattle to end at Alki Beach, diagonally opposite to Kerry Park. The beach, with the waters lapping at the rocks, the running path, kites in the air, dogs jumping at Frisbees all offer a new viewpoint. Across the bay we could see Seattle and Queen Anne hill standing tall. Our only regret, still not clear enough for Mount Rainier to peak through. We headed into Fremont and headed to Brouwer’s Cafe to drown ourselves in stout beer and pig out on the Belgian fries. Maybe it was the beer but the fries were fantastic. Old friends, lots of SW Giri and we knew this is how a vacation had to end. Dinner was at Jai Thai, a popular Thai food chain in Seattle. Try the Meing Hum, Yum! Thus ended our perfect and rare sunny day in Seattle. We went back to our hotel for a good night rest and caught the Light Rail back to the airport in the morning.